Note: I received a copy of this play from Playwrights Canada Press for review. This does not impact the content of my review. The Invention of Romance is interesting, funny, and sweet. It has definite moments of great entertainment with likeable characters and interesting conflicts. I love rom-coms. I do. No shame. And, I love the idea of this play. But…it didn’t quite work for me. So, I can only give it three stars. It was okay. The dialogue was fun and snappy. It worked. There was some great sarcasm and all the mostly-believable miscommunication that you would expect to find in a romantic comedy. The characters were cute, and most had some dimension. They all fit into their tropes, the roles you would expect them to play in the genre. Most of them, except for the too-good-to-be-true-dream-guy, had unique qualities that set them apart from other standard rom-com characters. The Invention of Romance is a typical romantic-comedy. It has a sweet, likeable, but oblivious female lead. She is flustered by life and work and the hurdles she has had to navigate. She’s feeling like maybe she missed the train somewhere. And, as usual in rom-coms, she doesn’t see what’s right in front of her. I enjoyed her relationship with her mom. I also enjoyed the play within the play, and the cute story of Kate’s mom’s old romance. As much as I enjoyed the concept and liked the characters, I had a hard time picturing how this play would look on the stage. I had a hard time picturing how it would look on the stage. There is very little set or scene description. All scenes take place on the stage with little or no set change. It felt like spotlights would maybe be used to highlight the active part of the stage, each area set with limited items to create just enough of a hint of where they were. At times, Kate broke the fourth wall and stopped mid-scene to speak to the audience. I like this technique but had to wonder how exactly it could work in these scenes. I found it confusing to read and have to shift from my perspective. These scenes may be less confusing to an audience member when observed rather than read. 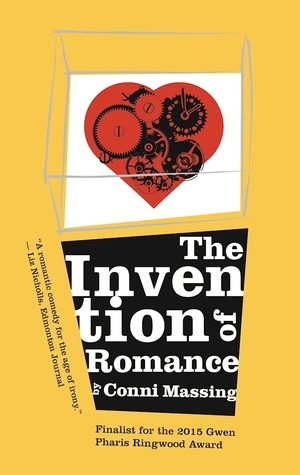 I found some scenes confusing, but overall, I enjoyed reading The Invention of Romance. The story ends how you would expect a romantic comedy to end – in a sweet and satisfying way. If The Invention of Romance was being staged near me, I would definitely go see it. What’s your favourite romantic comedy?